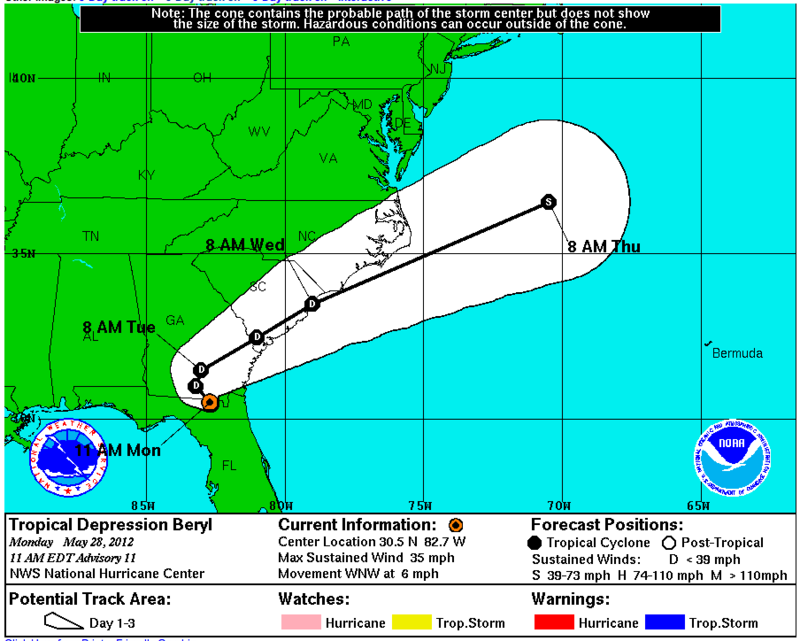 BERYL IS EXPECTED TO PRODUCE TOTAL RAIN ACCUMULATIONS OF 4 TO 8 INCHES…WITH ISOLATED MAXIMUM AMOUNTS OF 12 INCHES…FROM NORTHERN FLORIDA THROUGH SOUTHEASTERN NORTH CAROLINA. So: potential for heavy rains, dangerous surf and some coastal flooding — though both abating somewhat, high winds — but those too are abating. The updated forecast map has the tropical depression passing just to the north of Savannah on its way back out to see. I’ve gotten a little much-needed rain here at my house, but not nearly as much as some locales south of Savannah appear to have gotten. For much of the morning, there was a strong band of rain not far off the coast of Tybee, but it largely fizzled as it rotated inland. And for those wondering why I’ve made all these Beryl posts: I’m a stormwatcher and I check the NHC updates every 3 hours if I’m awake and it’s convenient, plus I’m frustrated that other outlets either aren’t giving updated information about the storm or aren’t including appropriate graphics.